In a clear attempt to shrug off its �policy paralysis� image, the UPA Government today re-started the process of big-ticket reforms, allowing foreign direct investment in the controversial multi-brand retail trading and aviation, enhancing foreign investment in broadcasting sector, diluting local sourcing condition for single-brand product retailing and off-loading a portion of its shares in four public sector undertakings. The Supreme Court today placed �Coalgate� under its scanner by seeking the Centre�s response to a PIL plea for quashing the allotment of 194 coal blocks to private companies during 2004-11 �in a pick and choose manner�, causing a �huge loss� to the country. The Inter Ministerial Group (IMG) on coal today began another round of consultations on the presentations made by private companies on coal blocks allocated to them that have seen no development. Hoshiarpur District and Sessions Judge GK Dheer has ordered issuance of death warrants of Jasbir Singh and Vikram Walia, convicted of kidnapping and murdering 16-year-old Abhi Verma alias Harry, the son of a jeweller, in Hoshiarpur in 2005. 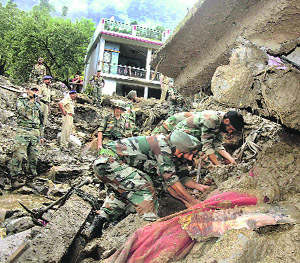 Twenty-two persons were killed in a cloudburst that struck Rudraprayag district of Uttarakhand early this morning. As many as 40 others have been reported missing. The Punjab and Haryana High Court today refused to to vacate the stay on collection of toll on the Delhi-Gurgaon Expressway. The High Court pulled up the Municipal Corporation Delhi (MCD) for not paying attention to the problems faced by commuters using the expressway.